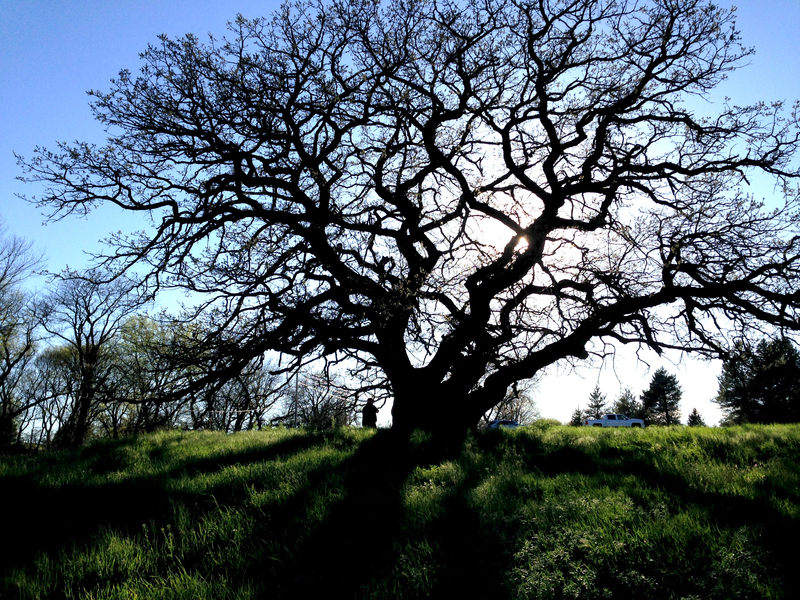 Bur oak is considered by many to be the king of Great Plains native hardwoods. It is the most common native oak in Nebraska occurring naturally along many rivers and streams in the eastern third of the state and can be found in pockets here and there as far west as Hitchcock and Dawes counties. Bur oak is tolerant of city smoke and other air pollutants and of soils that are compacted, sandy, and/or of high pH – it is commonly planted as a shade tree in many urban areas of the United States. The trees become large and are suited for lawns and other open areas, including golf courses, parks, large islands, and fields. They also are useful in rehabilitation of degraded sites and have been widely planted in windbreak and shelterbelt systems because of their drought tolerance. The tree has distinguishable fan-shaped leaves that can vary greatly in size from tree to tree throughout the region. The leaves turn a rather non-descript tan-brown in the fall and fall relatively quickly from the tree. The tree’s thick, corky bark allowed it to withstand wildfires better than most and thus became one of the dominant trees throughout much of the prairie region. The scientific name ‘macrocarpa’ means “large fruit” referring to the tree’s large acorns enclosed in a distinguishable bur-lined cap that wraps most of the way around the nut. The acorns are eaten by many birds and mammals, including squirrels, rabbits, ground squirrels, mice, deer, black bear, wild turkey, wood ducks, flickers, woodpeckers, and blue jays. They are dispersed by rodents and blue jays, which frequently cache the acorns for later use. Bur oak is browsed by deer, elk, and cattle. Red-tailed hawks, screech owls, fox squirrels, and flying squirrels nest in large trees of bur oak. Another hybrid cultivar tree enthusiasts could try is the bur-gambel oak. Noteworthy bur oaks found in Nebraska include the outlying population in Bur Oak Canyon near Culbertson; the trees with the remarkably exposed root systems growing on pure sand north of Albion; the towering trees in Beatrice’s Chautauqua Park; the nearly 500-year-old tree found at Ponca State Park; the canopy grove in the campground on the north edge of Fullerton.